We started our pork project in the spring of 2011 with nine pigs from a specialty breeder in Missouri. 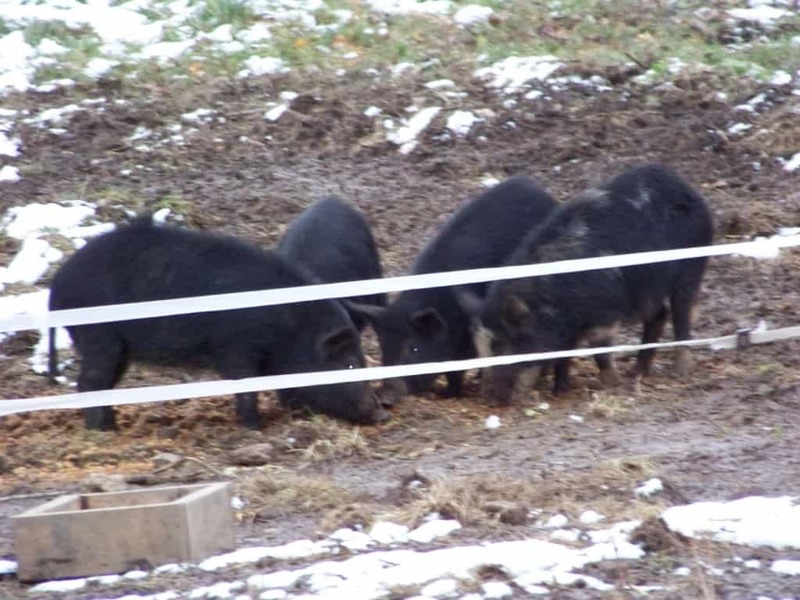 We purchased eight piglets whose father was a purebred Gloucestershire Old Spot (Spotted Orchard Pig) and whose mother was a Duroc Hampshire cross. We got one piggy whose father was a Large Black and whose mother was a Duroc Hampshire cross. We raised these pigs with supplemental organic feed until July. After that date they fed entirely on pasture and waste from our commercial kitchen and cider line. They were happy and healthy without grain during the summer and fall. These older breeds of pigs were known to survive and thrive on pasture, woodlots, and orchards. Our plan is to try several of the oldest breeds and find out which ones will thrive in our environment. We are in the process of building a herd with some of the oldest genetic lines available. We have fenced a pasture ring circling the ridge top where our orchards and gardens are concentrated. We can move the hogs through these pastures without bringing them into the fruit production areas. Now we can flash graze the animals in the blocks we choose without having them run through the blocks where they are not wanted. We train the young pigs to electric ribbon wire. We can then set up small concentrated pens exactly where we want them. When they are done doing their work we can move them to a new part of the orchard, or move them back into the ring pasture. We built a portable shelter for the pigs to sleep in. When we need to move them we throw some feed into the hauler and after they run in we close the door behind them. 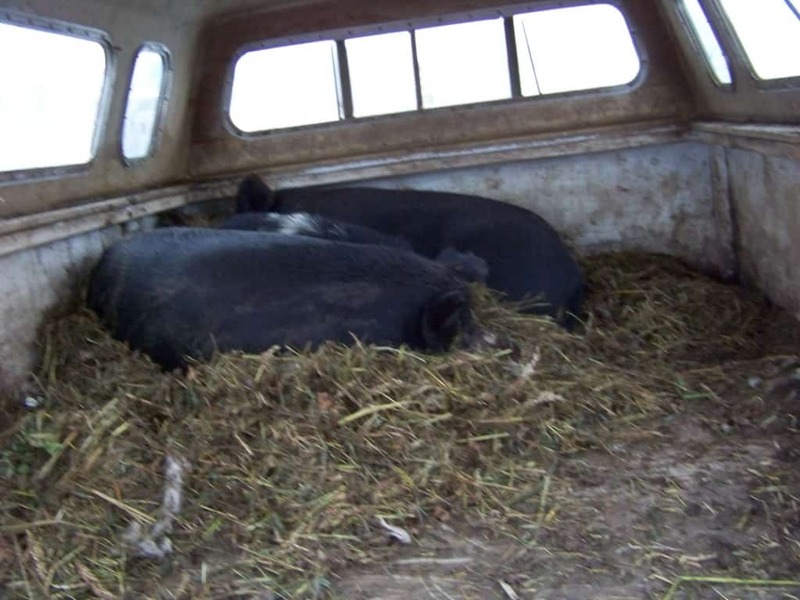 Portable pig hauler with sleeping pigs. 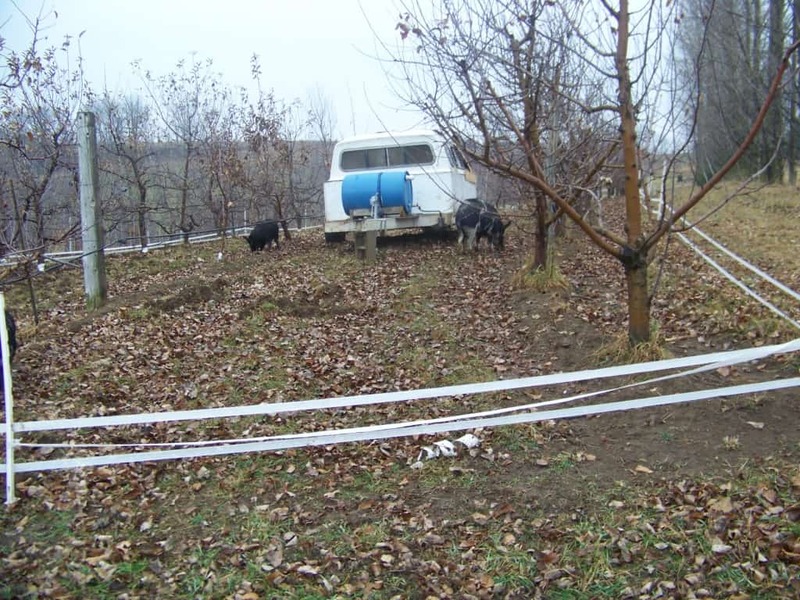 In the early spring we will rotate the hogs through the orchards allowing them to work up the soil under the trees. We do not ring their noses so they are free to use their natural bulldozers and get the bugs, grubs, mice and voles that are getting ready to feed on our trees and crops. 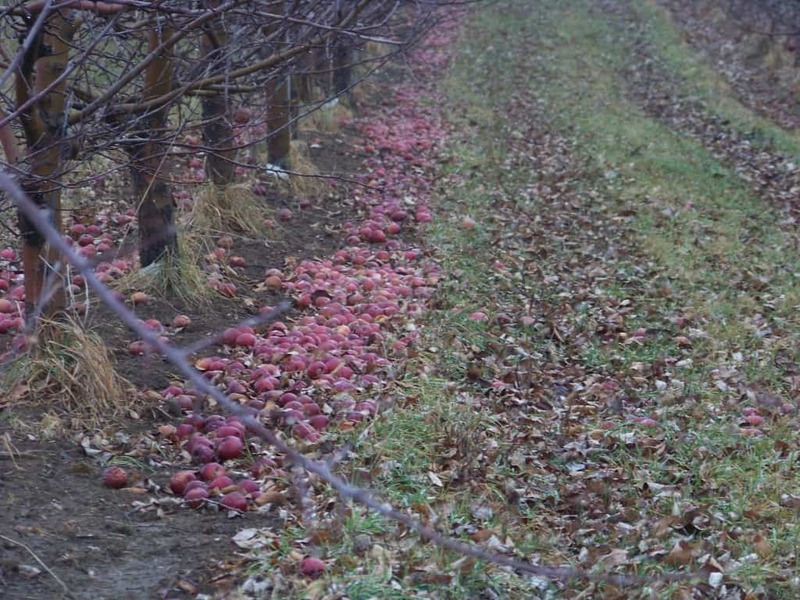 The natural cultivation of the soil helps break down apple leaves and reduce disease inoculum under the trees. This light cultivation also disrupts some of the apple pests that are completing their life cycle in the soil under the trees. After they work up the soil under the trees they will go back to the ring pastures. In June apple trees drop some of the crop, especially if they had a big bloom. In July we also hand thin the apples to give the trees a crop in balance with the vigor of the tree. The pigs will be grazed through orchards again to scoop up these yummy little sour green treats. They don’t taste very good to you and me but they pigs sure love them. When they eat the drops they also eat any apple pests that may have found their way into the apple. Apple trees will often drop an apple if it has a bug in inside. Many bugs have evolved to move into the soil after they have eaten what the need from the apple. The pigs break this cycle by eating the apple (and the bug in the apple) before the bug can move into the soil, complete its life cycle and infest the orchard. After the berries are harvested we move the pigs into the berry beds to eat up the over ripe strawberries or to work up the soil under the raspberry canes. They do their work here by disrupting the insect and disease cycles just like they did under the apple trees. But now they get a different treat to hunt for. In the late summer after the cherries, apricots, and plums are harvested we move the pigs into those blocks. They find every little piece of fruit that is on the ground. Their sensitive noses lead them right to the fruit. Sometimes you can hear their powerful jaws cracking right through hard pits. They will even eat the pits that are still on the ground from fruit that was missed the year before. They crunch them down like they were peanuts. After all the summer fruit are finished we start moving the pigs under the apple trees that are harvested. We have over fifty varieties of apples ripening from August into November. As each variety is finished we can set up the portable ribbon wire fences and put the pigs right under the trees that were just harvested. You won’t find a happier pig than one that just walked under an apple tree with the ground full of drops! We can continue to move the pigs through harvested orchards into November and December. They don’t mind the mushy apples after they have been frozen. Our hogs have a happy life doing what pigs love to do. They are happy and healthy and about as natural as they can be. Regular exercise combined with a varied natural diet of fresh pasture and fruit creates a healthy animal free of synthetic hormones, antibiotics, wormers and other medicines. We plan to get breeding pairs of several ancient breeds such as: Gloucestershire Old Spot, Mule Foot, Mangalitsa, Large Black, American Guinea hog, and the Ossabow Island Hog. We plan to produce some purebreds but our main goal will be to cross these old breeds to give us more vigorous offspring to raise for meat. Most of the breeds that we are raising are endangered. By establishing herds and keeping breeding pairs we are helping to save these lines from extinction and keep more genetic diversity available to farmers. Unlike endangered wild species of animals, in order to save heritage breeds, we have to eat them. Farmers won’t raise them if they can’t butcher them and not many zoos or conservancies want domestic breeds. By raising them and making them available to other farmers, we are helping to save them. The meat from our hogs is like nothing you have ever tasted. The flavor and texture of this pork is amazing. We do not have a large herd yet. Our pork is very limited in availability. Watch for announcements in our newsletter or on our website. We will let it be known when we are butchering, what will be available, and where it will be sold. Email us if you are interested in purchasing pork directly from us and we will put you on a waiting list. While we have to give credit to the local farmers who take the time to raise their pigs in an outdoor setting and not confine them in large dark buildings, we feel we have to point out that ‘natural’ pork is very different from organic pork. There are many aspects to consider beyond outside vs. inside hogs. Some natural pork producers are very committed to the environment and meat quality while others are only a step above the confinement operation. 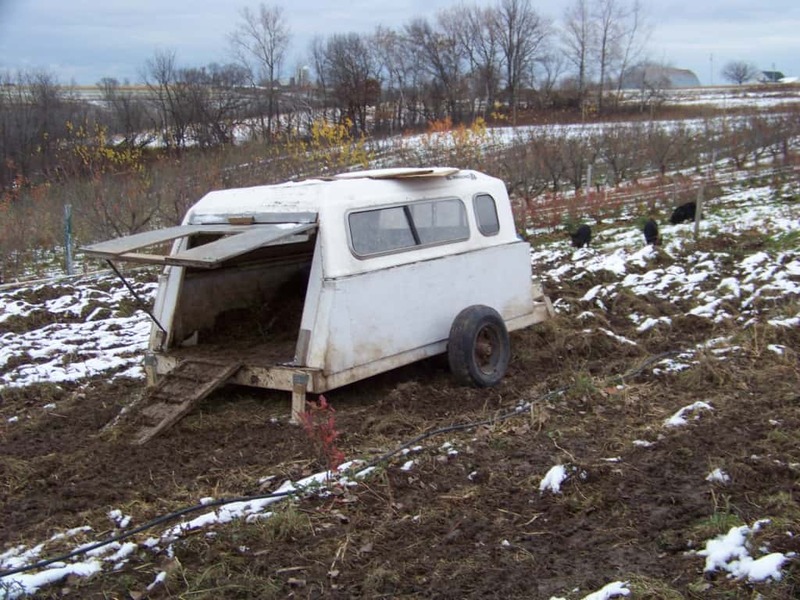 Even if pigs are raised on pasture they may not be much better off that the ones inside. If the farmer is raising the same fast growing breeds as the CAFO, crowding them together on a sparse pasture, feeding high protein ration (with minerals, hormones, and antibiotics), regularly treating with worming medicine, and using GMO corn and soy feed, the pork is not going to taste very natural. This type of operation is still putting too many animals together and keeping them in an unhealthy environment. Some natural pork producers will go a step better and give the pigs more space and rotate them on fresh pastures, but the pigs are still getting the same GMO feed, antibiotics, hormones, and medicines. The big issue comes with the feeding system. You may not realize this but pigs can be lazy. If you put an unlimited supply of high energy grain out for them, they will take the majority of their nutrition from the trough, even if they have lush pasture under foot. Other natural pork producers will go a couple steps better and source non GMO feeds, eliminate the hormones, and take the antibiotics out of the daily feed ration. But they still give the hogs as much as they can eat from the auto feeders. The hog is fed grain that was grown with chemical fertilizers and pesticides. It over eats and grows at an unnatural rate. It is given antibiotics when it gets sick and is regularly wormed with chemicals. The feed is grown in conventional fields with conventional impact on the environment, and it is often trucked and transported many miles using even more fossil fuels. With certified organic pork you know how the grain was grown and you know how the hog was fed organic feed free of synthetic inputs. You don’t have to ask me and I don’t have to explain it to you, because the standards are defined by the National Organic Program, and MOSA certifies that I followed those standards. With natural pork you need to ask your farmer about his production practices because there are no enforced standards for ‘naturally raised hogs’. Is the feed a conventional ration with hormones and antibiotics added? How old are the hogs at slaughter? If they are only six or seven months then they are really pushing the growth. How often are the pigs treated with antibiotics? How often are the pigs medicated with wormers? What do the pastures look like? How often are the pigs moved to fresh pasture? What hog breeds are being raised? The regular use of wormers and antibiotics is a pretty good sign that there are too many animals too close together. If pigs are given fresh pasture and regularly rotated at a proper density, worms and illness are rare. Hogs have evolved with their mouths in the dirt most of their life. They find nutrition in a zone one foot above and one foot below the soil line. They are omnivores that can adapt to just about any food source so long as they get a variety of plants and access to the soil. This incredibly adaptable animal does not need antibiotics, synthetic hormones, worming medications, or isolation from potential pathogens as the confinement producers claim. These are methods needed to keep sick animals alive that are in a high stress, low activity lifestyle, with a high calorie diet! Call or email if you are interested in meat from our happy healthy orchard raised hogs.